I was mesmerized by the beauty and the greenery of the place. The greenery refreshed my mind. 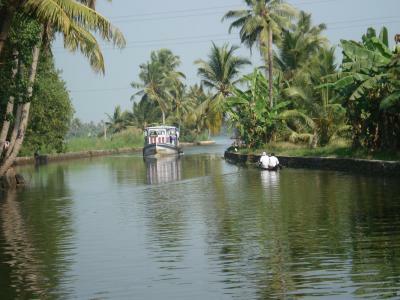 I was travelling in a boat through the backwaters of the place, when I took the snap. My camera is a compact one. SONY DSC W70. India is a great country for photographers – colour abounds! And it’s refreshing to see a submission that shows the natural beauty of the country. The subject matter here is good – palm trees, water and two men in a boat. I am drawn at first to the composition here. The [picture seems a little 'top heavy'. What do I mean by this? Well, all the interest is in the top of the photo, and the bottom half is taken up by empty water. The rule of thirds is the classic method of placing focal points in a picture, and this photo doesn’t quite fit the rule (click to read more about the rule of thirds). Just imagine if before pressing the shutter the camera was moved up (skyward) a little. We would cut out much of that empty water, and we would also avoid chopping off the top of that palm tree to the right. Apart from the rule of thirds, I would recommend the use of some photo editing software with this photo. There are three areas I would edit. First, the camera appears to be tilted a little, with the water sort of draining away to the left of the photo, and the motor boat listing. I would use the crop tool to nudge the image straight. Click for a digital photography tutorial on using the crop tool to straighten images. My second area for editing would be to boost the colours a bit. The greens and blues are lovely, they just look a bit weak. This would be easy to do by using the 'saturation' tool found in all image editing software. Finally, I would reach for the clone stamp tool, and clone out those cables. On a photo like this it would only take minutes, and I think it would improve the photograph overall. 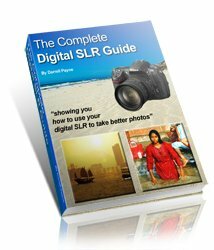 Click for a digital photography tutorial on how to repair photos with the clone stamp tool. I’m beginning to sound a little negative here, but I don’t mean to be. This is a lovely photo; my tips are just suggestions on how it could be improved further. Read a hands on review here. I like your photo very much. It looks so peaceful! I would love to go there. Is Ed right about the photo tilting? If it tilts then it only tilts a little bit.